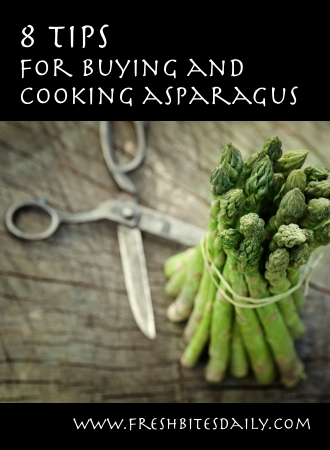 Asparagus is a delightful healthy vegetable but it is easy to be frustrated with tough stalks and keeping the vegetable from spoiling. Follow these quick tips for a better asparagus experience. Asparagus is harvested in the early spring, in the cooler days of spring. Look for it to hit the market then. If you live in a warm Winter climate, like Phoenix, look for it in the Winter. Fresh asparagus in your market that seems out of season for you has been transported in from some other growing zone. If you are committed to eating local, be aware of this disparity. Asparagus is sold by the pound. When you buy a bundle of very thick spears about 1/3 of the weight is too tough to eat. The slimmer spears are, therefore, a better buy and they lack no flavor. Look for a bundle of asparagus spears that have tight buds at the top. These are younger or fresher than the bundles with loosely formed buds. Either way, the tighter budded asparagus will have more flavor and last longer in the refrigerator. Refrigerate you asparagus as soon as you get home. Store it in an open paper sack so it can breathe. No plastic! Asparagus stored in a closed plastic bag will get soggy and mold very quickly. Wash the asparagus when you are ready to use it, not before. To store wet asparagus risks mold. For cleaning, soak the spears in a pan of cool water for 3-4 minutes. Swish a few times to loosen sand and soil. Lift the spears from the water. Check for soil in the bottom of the pan. If there is some, dump the water, refill the pan and repeat the soak. The second soak should do it. When preparing your asparagus for cooking, hold the budded end of the asparagus spear with one hand and snap off the tough end with your other hand. The spear will snap at the point where the tough part starts. This point is not that obvious by just looking. Snapping tells the story. If you are making asparagus soup, simmer the tough asparagus ends for 20-30 minutes in the broth to get a richer asparagus flavor. At the end of the simmering time remove the tough asparagus, then continue on with your soup recipe. If you are blessed with an overload of asparagus, consider freezing the surplus roasted, pre-cooked for later luscious uses.